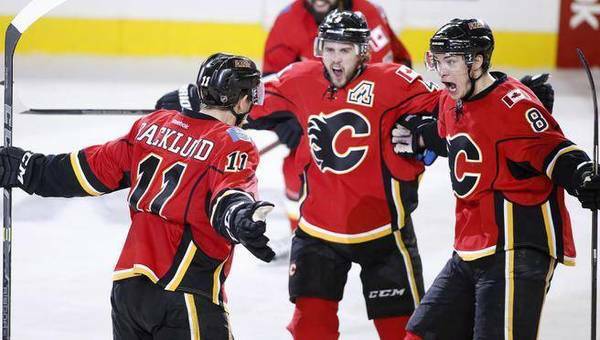 The calendar year of 2015 was certainly one to remember for the Calgary Flames. The Flames authored some of their most memorable moments in recent history over the last 365 days. So, as we get ready to ring in 2016, I’ve compiled my top five moments of the last year. The best part about this is it’s just one person’s opinion. These are my top five moments, and they may be totally out of whack compared to yours. Compare, contrast, argue, and debate in the comments. Let’s roll ’em out! In a tight, tense, nerve-wracking affair, the Flames used Kris Russell’s late game heroics to take a lead in a series they would never trail in. It was an extremely fitting way to open Calgary’s first post-season appearance since 2009, because it followed the script they had used so many times during the regular season. The Flames trailed game one of their first round series 1-0 after two periods, as Bo Horvat had opened the scoring midway through the middle frame. But David Jones tied the game in the early stages of the third period setting up Russell’s game winner with 30 seconds to go. After winning 10 games in the regular season when trailing after 40 minutes, game one against the Canucks was the first of three times the Flames would post a third period comeback win. I was broadcasting live from Schanks on McLeod Trail that night and that goal got one of the biggest eruptions of the entire playoff run. For a guy the Flames picked up off of waivers, it’s pretty impressive to think that David Schlemko authored one of the highlights of the season. Schlemko was picked up shortly after the news of Mark Giordano’s season-ending biceps injury was confirmed, and he started off his career with Calgary in fine fashion. No one expected Schlemko to do what he did that night in Boston, but I think we all were intrigued when Bob Hartley sent him over the boards to take Calgary’s eighth shootout attempt at the TD Garden. Kris Russell told the story afterwards about how he yelled at Hartley to put Schlemko in, as he knew about his breakaway ability going back to their time together with the Medicine Hat Tigers. That scouting report certainly paid off. Truthfully, I’m still a little disappointed the Flames didn’t bring Schlemko back on another one year contract. He’s an effective depth defenceman who I thought would have been a nice, affordable fit. Alas, that didn’t happen, but his shootout goal on March 5th did… and it was pretty neat. Five years of frustration, anger, and in some cases apathy was washed away when Jiri Hudler sealed a 3-1 win over the Los Angeles Kings in game 81 of the season. With an opportunity to clinch a playoff spot for the first time since 2009, the Flames played host to the defending Stanley Cup champions who knew their season was on the line. And Calgary answered the bell. First period goals from Johnny Gaudreau and Hudler had the Flames up 2-0 heading to the third period when things got really tight. Jordan Nolan would cut the lead in half five minutes into the final frame and, as you can see below, the Kings pushed with all their might to tie this thing up. The reaction in the Saddledome that night when Hudler scored to seal Calgary’s playoff berth truly was awesome. I’ll never forget hearing the eruption when that puck went in, and the noise in that building at that time rivals anything I’ve ever heard in those hallowed halls. Matt Stajan chose perhaps the best possible time to score his first ever playoff goal. In one of the craziest series clinching games you’ll ever see, Stajan gave the Flames their first lead of the game with 4:17 remaining in the third period. I’m not sure you could have scripted things in a more insane fashion. Facing elimination, the Canucks opened up a 3-0 lead in the first 10 minutes of the first period and looked very well on their way to game seven back at Rogers Arena. But, as they did/do, Calgary stormed back and had this thing tied just over five minutes into the middle frame on goals from Micheal Ferland, Sean Monahan and Johnny Gaudreau. Thanks to Luca Sbisa’s first of the post-season, though, the Flames trailed 4-3 heading to the third period. A powerplay goal from Hudler tied game six just over six minutes into the final stanza, which set up Stajan’s heroics with time counting down. 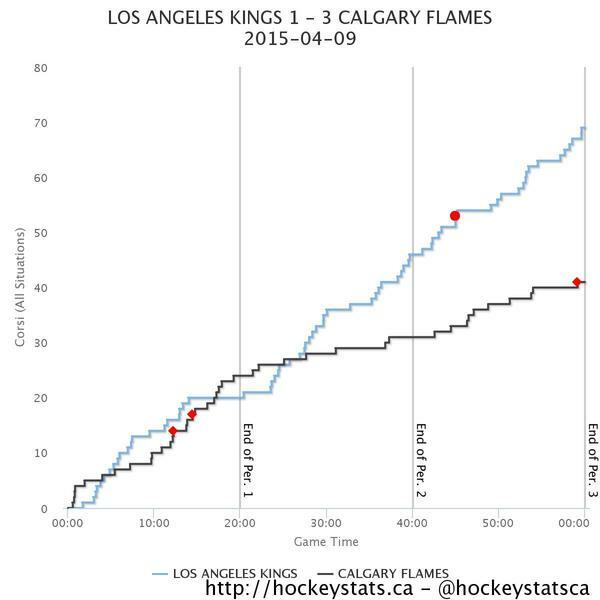 Sure, Calgary could have won game seven in Vancouver, because this series really was a pick-em from start to finish. I think Flames fans are happy we never had to find that out, though. I cheated on number one, because it’s actually a combination of two different moments. It’s my article though, so I make the rules. I take you back to game three of Calgary’s second round series with the Ducks. Trailing the series 2-0, the Flames were 20 seconds away from falling down 3-0 and facing an unceremonious sweep. That’s when things turned on a dime and the roof almost popped off the Saddledome. Gaudreau’s game tying goal to send game three to overtime is one of the single loudest pops I’ve ever heard at the Saddledome. It was probably louder than an even more important goal scored early in overtime. I know I missed a few standout moments from the last calendar year, because as I was writing this I thought of a few others. Debate and discuss, and please have a blessed and wonderful 2016. That was in 2014, you beautifully sarcastic dolt. Great stuff Pat. This version of the Flames have given us some great moments. Thanks. Great list. No arguments here. Also, I love the call on Johnny’s game tying goal; the commentator, not sure who, has a great voice for this. Fully agree on #1 . I had the great luck of that being the first playoff game I physically attended. You couldn’t script a better ending. Fitting that most of these moments have to do with the playoffs. Playoff hockey is something special. There’s so much more emotion tied to it, and it was a treat to watch the Flames in playoff hockey after a 6 year absence. I remember watching those games and not being able to look away, especially in that overtime game with the ducks. Boy, what a ride that was. Thanks for this, Pat! Nice job Pat, totally agree. There are two other points about that goal by Johnny that make it even more crazy. 1. I was at the game and Bennett had just tied it and the goal was disallowed. I don’t care if it was the right call or not, but we were all in the stands on our phones on twitter and watching the replay, and we were absolutely convinced it was going to be a goal. Then when it was disallowed the place went nuts. I have never seen it like that. we didn’t go “Vancouver Nuts” but the place was MAD! Then Johnny scores. So to go from worried to elated back to worried then to angry, then back to elated was why it was so crazy in there, I think anyway. 2. The goal itself is just sick… In round 2 of the playoffs against a team that has mostly dominated you, to just walk in on the wing and absolutely shelf that shot is crazy ballsy. If that shot is 5 inches high or wide, it rings the boards and it over. Just a complete money, “big boy” play. You are right too, the OT goal was almost secondary at that point. Johnny friggen Hockey man… jeesh! These are honestly my top 5 moments of 2015 as well! Living in Vancouver, and going to my first playoff game repping the red! The camaraderie amongst the flames fans before and after the game was something I’ll never forget. Getting harassed that whole game by Canucks fans around me, only to have us win the game was 30 seconds left. Leaving Rogers arena, hugging and high fiving everyone wearing the red. Never been more proud to wear the C in enemy territory. That had to be followed up by flying home to watch game 3 vs the ducks. Boy was it ever worth it, watching those videos again gives me chills. I will never forget how electrifying the dome was that night and thousands chanting go flames go as we made our way to the exits. Man 2015 was a great time for us Flames fans. 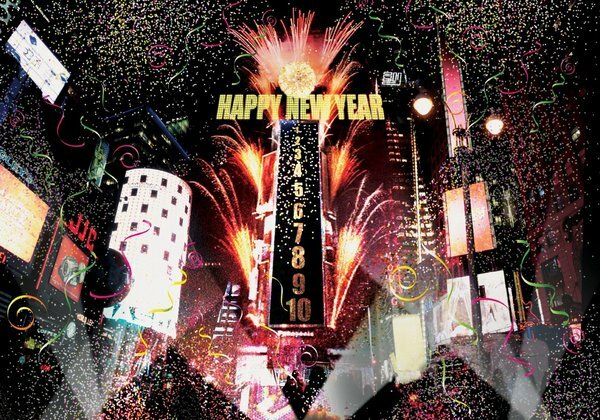 Hoping 2016 is going to prove memorable for us! I would’ve picked this as well (although I like Pat’s list as well). I definitely squeeeeeed and danced like crazy when I saw it was just picks! Second to Johnny’s goal in my memory. Specially because it came totally out of the blue and the Oilers were supposedly in on him. Then they panicked and overpaid for Reinhart! Oh, and we still got Kylington and Andersson. What a day. The Schlemko was awesome – BUT – I thought the other two games against the Bruins this year (February comeback from 3-0 with Brodie hitting the game winner in OT with 2 seconds left and the insane, WILD one just this month) were even better.